Love all the embellishments, cute!! This card is crazy cool, all the embellishments are so different but go together so well and don't feel clunky or messy. I love that! totally awesome card!!! super hip and trendy and IN!! i LOVE all of the layers and embellishments!! just amazing!! wow! That is an awesome card! I love these new sets. It's a very neat eclectic card. I love all the little shinny embellishments. I'm going to follow your blog and look forward to seeing more of your creations. New sets are really great. Thanks for sharing! Fun card!!! Such a cool combination of elements!! Love the collage look on this card! tfs! Lots of great elements on this card. OH! How I love looking at your layered cards! Beautiful...as always. So many LOVELY layers to look at! Super card. Loving this set! I love all of the wood. The stamps sets are soooo cute,I need some of them. what a super card, makes me want to travel! Fantastic card! Another stunning collage of sentiments, patterns, colors, images and embellishments. I love how you create and find it so inspiring. Thank you for listing what you did, that does help me a lot.. I love all the variety and texture you have on your card.. thanks for sharing. Really like how you've blended these elements. Wow. Gorgeous card. love the fresh color and vellum. What a lovely card! Makes me want to travel! Great card. I love all your idea's. So much fun. Lovely job. Fabulous card! I love all the layering and textures....and bling! Such a fun card, Lea! I love all your works, this card is amazing! Love your card, thanks for sharing!!! Wow I love all the different layers...the vellum looks amazing. Very cool use of layers. LOVE this - all the different elements all go together so well! Great job! Great card. I think Wanderlust is one of my favs along with filigree. I'd love to win a voucher so both of them could come live with me. What a fun card! 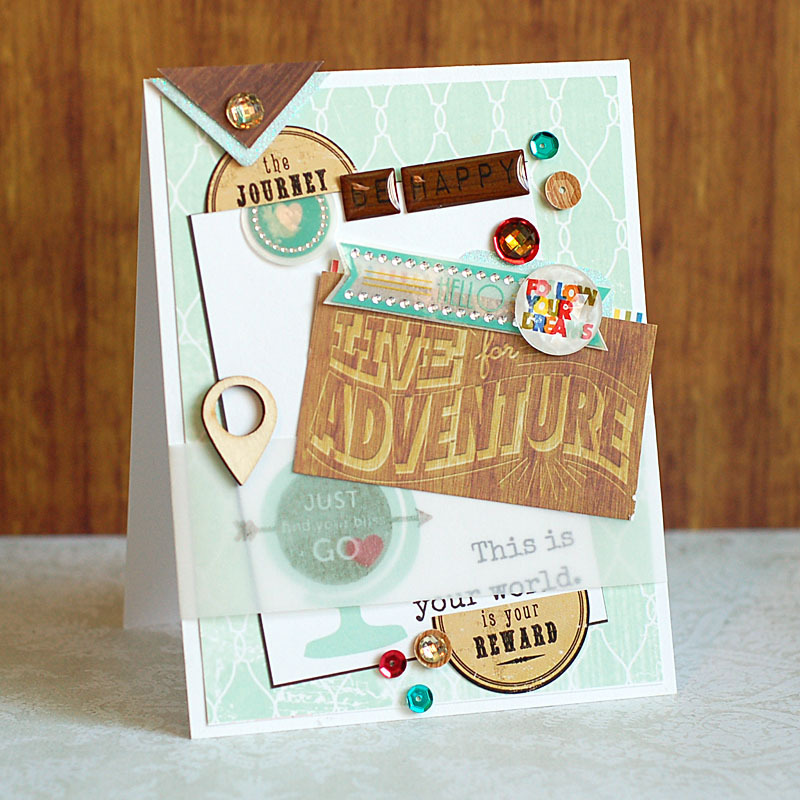 I'm loving the vellum and all the great embellishments, loving the new blog look too! Love the layering on this card! WOW! This card is amazing! I don't know where to begin because I love all of it and the little details are awesome! I am just in love with that colour combo. My weakness is that beautiful aqua colour! Nice job with your card! All the layers and sequins add a lot! Great card! Love your card...the new stamps look great! I liked the sunny days set best, but this is a close second. loved how you used it. Love all the special details on your card. What a beautifully detailed card...thanks so much for sharing it! Oh My, what a great card you made!! OMG.. this one is packed with so many different elements.. love the details. Thanks for sharing! SOOOO beautiful! LOVE the gorgeous layers and details!!! Stunning card; simply, completely and fantasically stunning! Perfect for showcasing the new ME release! Wow - amazing creation. Love all the details, layers and elements. Most eyecatching and interesting. So much yumminess to look at - as usual, Lea. Love that woodgrain with the pale blue. I love all the layers you used. Love this card! I can't wait to order the Wanderlust stamp set now! Love all your layering and embellishments! Nicely done with the embellishments. Fun card! Love all the sparkle! Love the colour combo and sparkle. This is such a great card. So much to look at. Love all the glitter and sparkle! Love all the little details and embellishments! Nice. OH MY WORD! This card is fantastic! I love how much detail you put into it! Love the sequins and all elements on this card, just fab!